Sprouts are very healthy as it contains more nutrients when compared to other foods and is very essential to include them in our daily diet.Many people do not like sprouts because of the raw smell, but when they are mixed with lots of vegetables and fruits and is mixed well with a sweet and spicy dressing the salad will be very tastier and one can hardly make out the rawness of those sprouts.This is one of the regular variety of sprouts salad which I make at home for breakfast.This sprouts salad goes to the event 'Let's Sprout' hosted by priya and also to siri's "My Legumes Love affair(MLLA) # 25" started by Susan. For the dressing take a small bowl and squeeze in the juice of one lemon and add salt,3-4 drops of honey,chat masala and mix well.Add grated ginger and minced green chillies and mix well. Add the dressing to the sprouts mix and mix well. Verdict: Clean bowled a bowl of salad within few mins. You can avoid onions,honey,ginger in the above salad and add grated coconut instead and also add a tadka of mustard and hing to the salad. 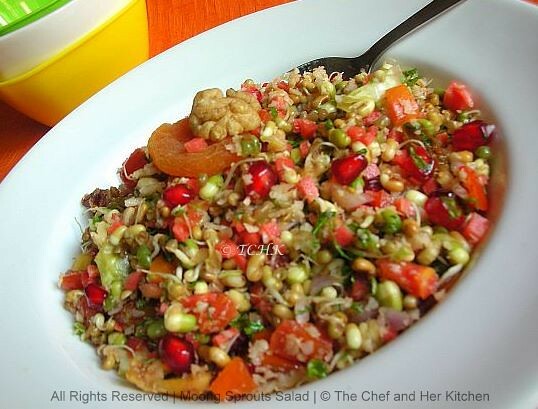 You can even add raw soaked groundnuts,chopped fresh grapes,sliced oranges/mosambi for different flavors. such a yummy treat to eyes...really very tempting healthy recipe...! loved d colorful clicks..nicely done dear. Such a beautiful,healthy, colourful and nutritious salad...yummm!! I'm fond of sprouts in any form. and love such salads. They go well even as a breakfast. very healthy salad. I also make a different version of this. Healthy salad... Normally taste and health dont go hand in hand.. you have made it look so tempting.. sure winner! This looks delicious and colorful. I make a similar version too. 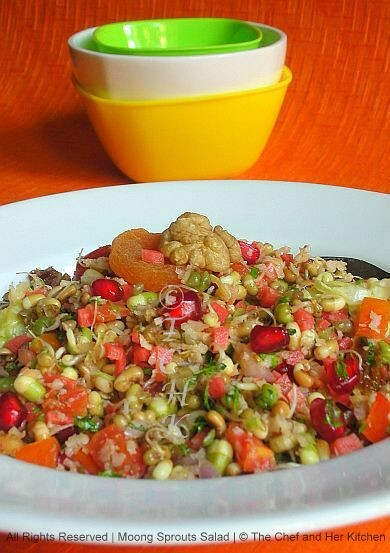 Sprout bowl looks very colorful, healthy and yummy. what a healthy salad, also a nice treat to eyes..
Hi Prathiba...hru doing? Hey, thanks for dropping by love2cook's ya! I hope it's not too late for me to arrive at ur lovely blog here. Following U! Wow looks healthy and tempting too!! We the viewere are clean bowled by your sprouts salaaaaaad. That's a lovely blend of flavors and textures. 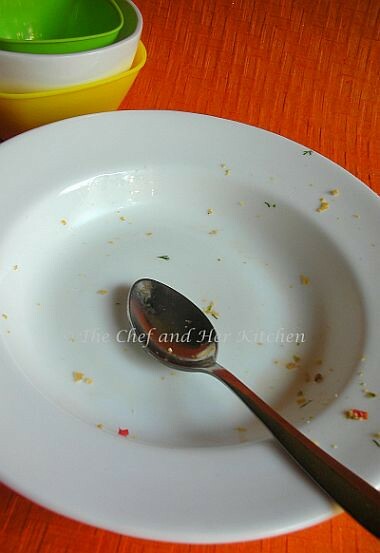 Lovely click..
Love the pic of clean plate at last.You make something as tasty as sprouted moong salad,the bowl is bound to be licked clean!! Salad looks colorful and yummy! hi prathy, first time here.. love ur collection.. love to follow u! !